My lifestyle can easily be categorized as “healthy enough.” I get to the gym as often as I can and try to eat well, stay hydrated, and get enough sleep—the list goes on. Recently, I’ve been feeling particularly average, mainly thanks to a packed travel and social schedule. I’m not one to turn to vitamins or supplements, but I do eat a mostly plant-based diet, so looking to buzzy new wellness brand WelleCo for that extra nutritional boost felt like a good solution to my current slump. The Australian-based company recently opened their first store in New York City, so I stopped in for a visit. Here’s what I learned about the much-talked-about brand and why it’s now a consistent part of my morning routine. Welleco opened their first New York City shop in Soho this October, and it’s worth a visit. As soon as I entered the store, I felt instantly relaxed and transported. 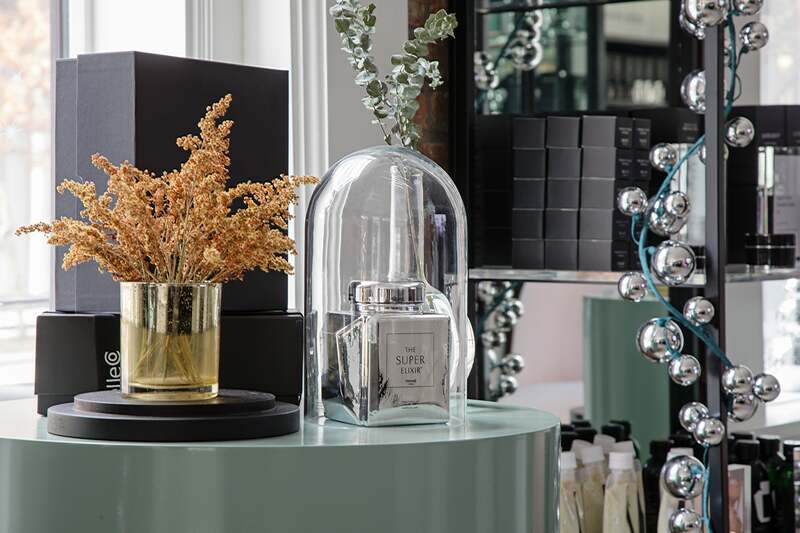 The interior feels like a luxe, Parisian apothecary, when in reality the shop is located off the bustling intersection of Crosby and Broome. I could have spent all morning perusing the products—and took many mental notes on the decor I wanted to copy (hello, matte black shelving). The pastel velvet seating made me want to sit and stay a while longer. There’s also a tasting bar, so you are able to try the many supplements available before taking one home. No, you’re not ingesting the packaging, so it doesn’t technically matter, but to me, it really does. The pretty packaging practically begs to be displayed in your home. I keep the Sleep Welle Calming Tea on my open shelving in my kitchen and my bag of Super Elixir Greens on my desk—and they both fit right in with my other decor. Even the product line color palette is chic. We’re so used to seeing and consuming supplements in plastic tubs that don’t align with our lifestyle or goals, but WelleCo’s mission, packaging, and product all fit seamlessly into my world. WelleCo is best known for The Super Elixir, an organic, plant-based supplement that contains alkalizing greens. It’s gluten-free, includes 45 premium whole food ingredients, and was created to be the only daily supplement you need to take. In the past, I’ve been skeptical of supplements in pill form—taking them always makes me feel a bit nauseous. Adding two teaspoons of the elixir is, for starters, super easy and never made me feel sick, as it was formulated to be easily absorbed by the body. Some of the key ingredients included are actually there to help promote digestive health—pre and probiotics, L-Glutamine for your gut, and psyllium husk and linseed for fiber are just a few. Benefits range from glowing skin to liver health, energy, and more. WelleCo Nourishing Plant Protein and the WelleCo Sleep Welle Calming Tea are similar, but serve as a protein supplement and calming stress-easing herbal blend. Transparency matters more now than it ever has before. I, personally, put emphasis on buying from and supporting brands I trust—whether it’s because they champion sustainability, align with my values, are a small business, or are women-run. If I’m going to invest in a product, I have to trust the people who are making it, which is why I researched the philosophy behind WelleCo. “At WelleCo we believe that beauty starts from within, and that a clean plant-based diet full of nutrients supports optimum wellness,” says Co-Founder Elle Macpherson. “When the body is nourished effectively at a cellular level, you feel better, and it shows on the outside. Our products are quality, premium and curated to elevate everyday life. If the modern consumer cares about the appearance of their body, skin, or accelerated aging and invests in a quality regime, it makes perfect sense that this includes nourishment from within and at a cellular level. Our loyal and ever-growing global tribe have faith in our elixirs, love the products and see and feel the benefits every day – from the quality of their skin, hair and nails, to increased vitality and wellbeing”. I start every day with a cold glass of water after I wake up and move onto cold brew once I arrive at my desk. Adding a glass of water mixed with The Super Elixir immediately after was a natural next move and an easy way to set my day up for success. I’m big into routines, so adding a third beverage to my morning ritual is just another intentional and mindful move that really takes very little effort. Keeping the elixir on my desk works as a visual reminder, too. After drinking almost every morning for two weeks, I can genuinely report that I feel good. I feel like I’m doing something good for my health, body, skin, and digestion, and I feel better knowing that on the days where my diet leans more grilled cheese and less vegetable-dense salad, I’m still getting nutrients that will keep me energized and focused. Visit WelleCo’s New York City store at 39 1/2 Crosby St, New York, NY 10012. Not in Manhattan? Visit WelleCo.com to shop all products online. Use the Code DOMINOXWELLE for 10% off your purchase.